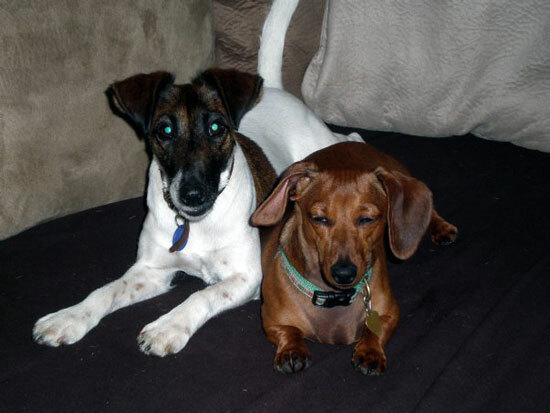 Because Oscar and Lucy travel so much — and because they are thoroughly modern terriers — many of their buddies are actually on-line. But just because we haven’t romped with them in real-time doesn’t mean they aren’t part of our pack. 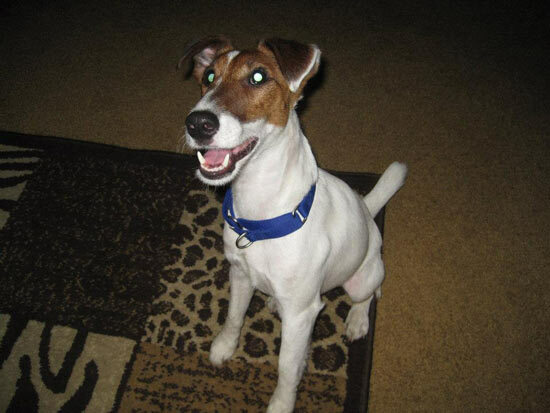 We meet our pals in a number of Facebook forums dedicated to Smooth Fox Terriers and those who serve them. 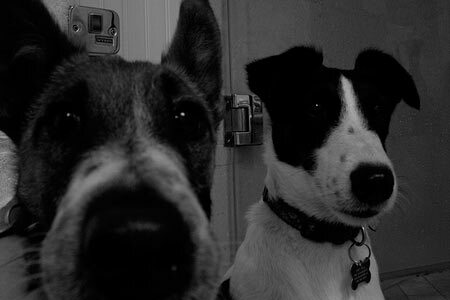 Or they are terriers who stopped by this blog for some virtual bum sniffing. 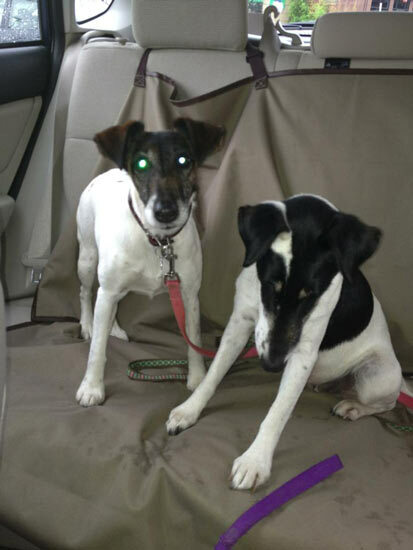 Doesn’t matter how they joined the Left Coast Cowboys Virtual Dogpark, all our Cyber-Terrier pals prove, it’s a Smooth Fox Terrier World and the rest of us just live in it. First I’d like to introduce you to a new member of the pack, Moonie AKA Moonchops, Moonface, Moonster, Monster, Moonertron and, for unknown reasons, Woogles. (Pretty standard. 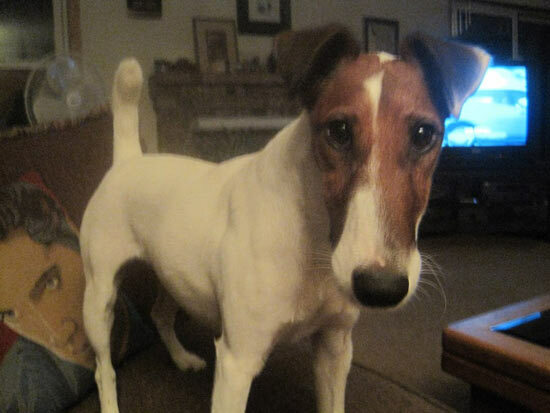 Are there any Smooth Fox Terriers out there who DON’T have a dozen nicknames?) Moonie is served by Tom, a photographer in Oxfordshire, England. 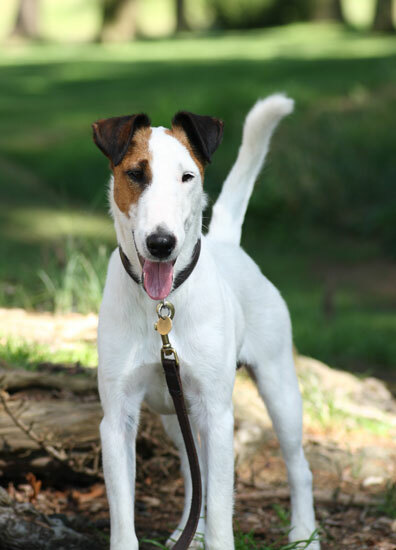 We met via Google as the search term “Smooth Fox Terrier handsome boy” brings up this blog and Tom’s, where he runs the Handsome Boy Modeling School. Here’s another shot of handsome Moonie — this time al fresco. 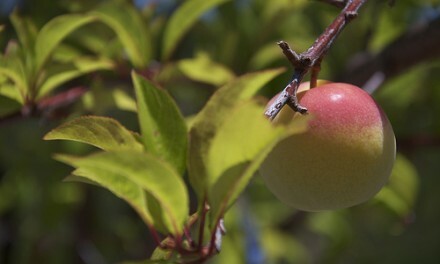 Moonie earned inclusion in the pack because he has a passport and does travel – most recently on road trip to the French wine region of Languedoc Rousillon. Tom notes that Moonie’s ears smell of chocolate crepes. 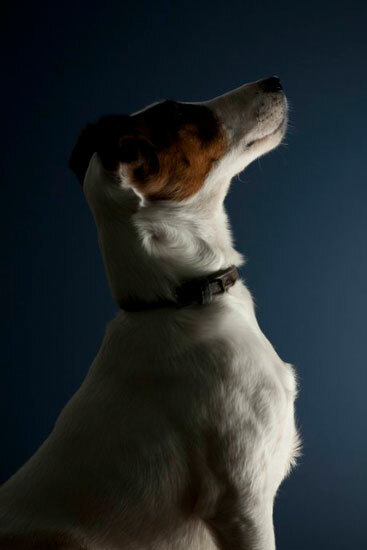 As you know we tackled the issue of sweet smelling Smooth Fox Terrier ears in this post where we also reviewed the Citizen Kane of all Smooth Fox Terrier movies. 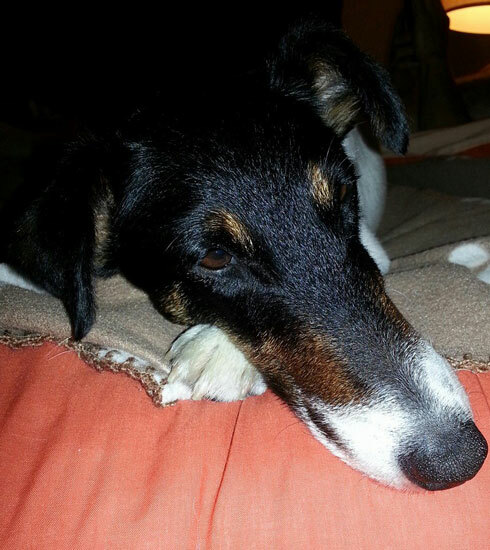 Next we move to another relatively new member who we met through the I Love Smooth Fox Terriers Facebook page. It’s Mozzie from Ohio, who is served by Barbara and Steven. In fact, Steven sometimes coordinates his outfit with Mozzie’s Thundershirt. Here’s a more glamorous shot of Mozzie, showing her elegant snout. Yes, butter wouldn’t melt in her mouth. 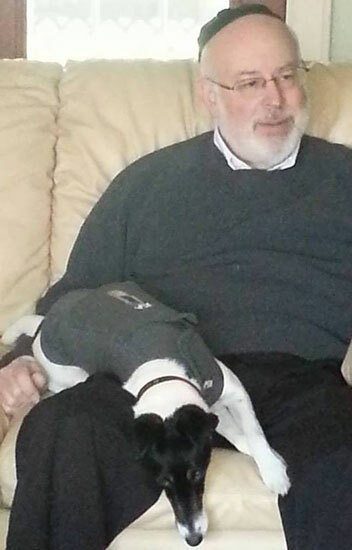 But, we hear through the Facebook that Barbara is seeking some terrier behavior modification advice. Which Oscar and Lucy would tell Mozzie shows a decided laxness in her ability to train her owners. However, since Mozzie is also sometimes called The Mozzinator, we feel she will soon get this situation in hand (or paw). Anyone who frequents the “I Love Smooth Hair Fox Terriers” Facebook page is familiar with one of our exciting new members. The irrepressible Cheetos, served by Roger in Washington State. Cheetos is a constant source of hilarity and, luckily, his personal assistant Roger, is usually in place with a camera and a Facebook post to capture it. 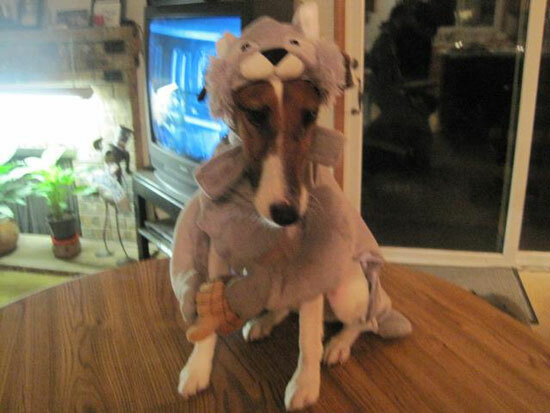 One of Cheetos major occupations is squirrel hunting. Also known as Cheesy Toes, Cheetos’ other talents include his Flying Nun ear impression and perching on his servant’s shoulder like a parrot. Cheetos is loaded with ‘Tude and has taught Oscar this signature stare. The next members of the Virtual Dogpark are…a Pack. And long-standing members. 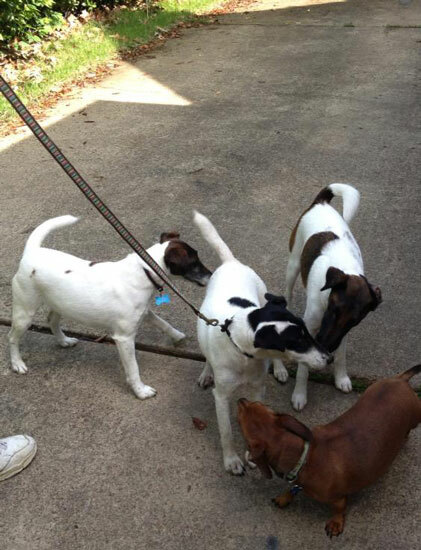 Three Smooth Fox Terriers and a Dachshund from Memphis who are served by Susan. 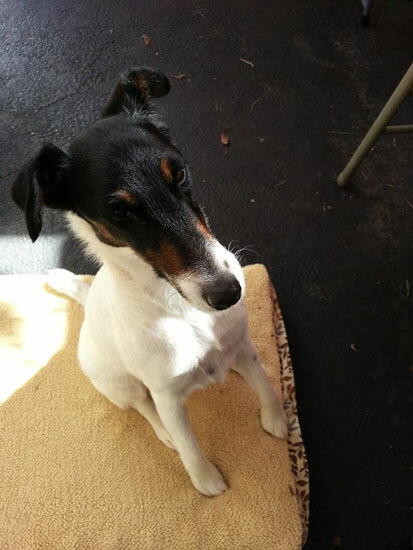 Yes, there is a Dachshund, but Britta is one of of the Long Ones who convinced us to extend the noble Smooth Fox Terrier family to include the honorary terriers now known as Smooth Dachs Terriers. I know I’ve seen a picture of this pack all together — which would be a minor miracle of photography judging by how hard it is to get Oscar and Lucy to sit still together for a portrait. Here are Nutmeg (Smoothie) and Britta, who I’m told really rules things down in Memphis. Hence the name of their manor, Stately Dachshund Downs. Fiona, right, is the latest addition. Here, she shows her elegant two-toned ear. 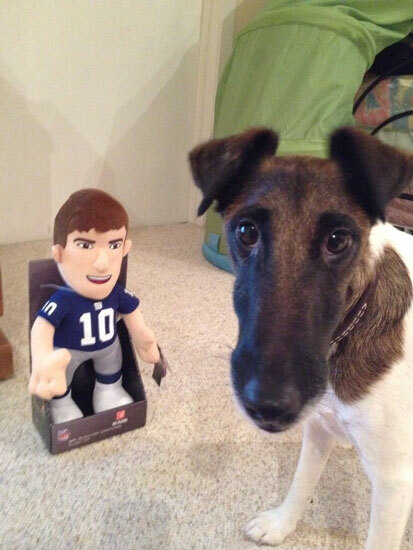 Here Jameson the Irish Car Bomb shows his Peyton Manning face. That’s our review of some notable members of the Left Coast Cowboys Virtual Dogpark. If you are owned by a wine-friendly, traveling, tech savvy canine that you think would enjoy romping in Cyberspace. Drop us a line and some pictures to lisa@leftcoastcowboys. Our pack is ever growing and we’ll be updating on a regular basis. PreviousAnd How Did You Get Here? NextTalk to the Blog, People! So good to see new and old friends in the Virtual Dogpack! The Canines of Dachshund Downs give this Sixteen Paws UP! Way up. Now, back to our naps. Django wants to join the pack…finally, dogs he can relate to! He meets all the requirements: Terrier; check! Loves traveling; check! At least a dozen nicknames; check! Wine-friendly; cheque! Tech-savvy; well, 4 out of 5’s not bad. Now I have to sift through our many photos of Django and find one to email you. Oscar and Lucy have set a high bar for great Terrier photos. Lisa, I love this. 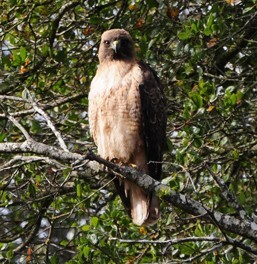 Thank you for including Toesies in your blog. Every year I get a reminder and I read it again.